Inspired by the long dark winters of Chicago, this exhibition focuses on the Sun at a time when it is missed the most, moments before springtime. As an object that is both illuminating and unseeable, the experience of the Sun is dominated by metaphor and myth. Were the Eye Not Sunlike channels the mythologization of the Sun and our relationship to its immeasurable power. Beginning on April 1, a three-part video program will unfold on the artist-made live streaming platform ACRE TV. The program begins with Sunrise and its thematic associations of stillness, repetition, ritual, crispness and intimacy. Reflecting the course of the earth-bound day, the following program, High Noon, tracks the warmth and optical energy of a bright, full sky. Sunset, the final chapter, evokes impending darkness, melancholy, loss and reflection. 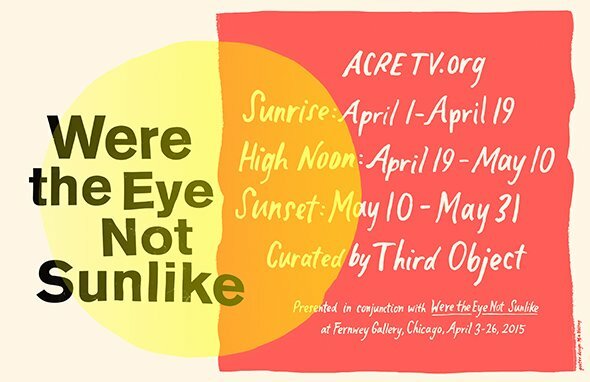 The ACRE TV program includes work by sixty-two artists from around the world and will run for two months.